If you are new to Mist.io you might want to review the quick start guide to get you set up. If you are looking to integrate Mist.io to your workflow, you should have a look at the REST API. There is also support to run Ansible playbooks and a command line client (CLI) that can help you automate all tasks, written in python. 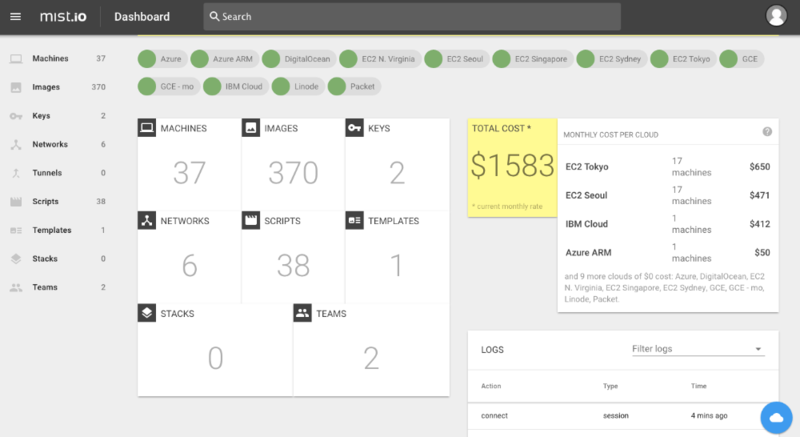 Mist.io provides a single UI and API for infrastructure and application management. From cost and usage reporting, RBAC, creating servers and deploying applications, to monitoring system uptime and performance metric or alerting and automating responses. Regardless of where the servers are hosted - locally, on a public or private cloud, a KVM hypervisor or a Docker engine, Mist.io offers a unified dashboard that reduces UI fragmentation and eases management.